WHAT ELSE CAN I EXPECT FROM AN ONLINE MASTER'S IN HIGHER EDUCATION? The professional field of higher education refers to college professors and faculty members, deans, student administrators and other personnel who work at colleges, universities and other postsecondary learning institutions. Jobs in higher education have grown in recent years to match the rising number of U.S. college students. According to the National Center for Education Statistics (NCES), roughly 20,515 undergraduate and graduate students attended a postsecondary institution in 2016 ― representing a 34% increase in overall enrollment since 2000. These numbers are also expected to grow by 13.5% in the next eight years. The vast majority of professors, administrators and other postsecondary education personnel begin their careers at the college level. A master's degree is considered the educational minimum for careers in postsecondary education; some positions, including professors, will usually also require a doctoral degree. The master's degree in higher education pathway prepares students for niche areas of the profession by allowing them to build knowledge and skills in areas like educational leadership, administration, community college teaching, education technology, and distance learning. Many of today's students are choosing to earn their master's degree in higher education online, rather than in a classroom. Web-based students follow the same rigorous curriculum as their brick-and-mortar counterparts, often leading to the same number of post-degree job opportunities. The flexible, study-from-home schedule are ideal for students with part-time jobs, childcare duties and other important commitments. Learn more about what you can do with an online master's degree in higher education and what kind of career opportunities you can look forward to with this comprehensive guide. WILL AN ONLINE MASTER'S IN HIGHER EDUCATION PROGRAM PROVIDE ME WITH THE SKILLS I NEED TO ADVANCE MY CAREER? Master's degrees in higher education are designed to build on the foundational studies of undergraduate programs while introducing more advanced concepts, theories and approaches to educating and accommodating college students. The curriculum will also cover ethics and laws specifically related to the way postsecondary education is delivered, financed and evaluated. Those who pursue master's in higher education degrees for teaching or administration should also expect to take part in practicum courses, or on-site training sessions;. Capstone projects are often required, as well. WILL AN ONLINE MASTER'S IN HIGHER EDUCATION PROGRAM WORK WITH MY SCHEDULE? Online master's degree programs offer a flexible, easily accessible alternative to traditional college learning. Students can download course lectures and readings, participate in virtual discussions with other students, submit written assignments, take exams and communicate with their professors ― all from their home computer. Current technology also enables them to study on the go using a laptop, tablet, smartphone and other portable Wi-Fi devices. For added convenience, students can usually coordinate practicum courses at schools and other locations that are reasonably close to their current residence. WHAT JOBS CAN I GET WITH MY MASTER'S DEGREE IN HIGHER EDUCATION? Job eligibility for those with a master's in higher education will largely depend on their areas of emphasis as a graduate student. Students who focus on educational leadership or administration will be prime candidates for roles in student affairs, housing, course registration, finance, and other key facets of college life. For aspiring professors, the master's degree will typically be a stepping-stone toward doctoral or Ph.D. programs; however, some postsecondary educators ― such as community college teachers ― are often considered for jobs once they have completed their master's program studies. WHAT ARE THE BEST ONLINE MASTER'S IN HIGHER EDUCATION PROGRAMS? Choosing a program is an incredibly personal decision, and only you can properly evaluate whether a target school's strengths match your educational needs. The following ranked list of schools should serve as a helpful starting point in your search for the best online master's degree in higher education programs in the United States. Our ranking is based on the courses schools offer, available specializations, student outcomes, career support services, and other criteria used to determine academic excellence. If you are considering an online master's in higher education, be sure to contact admissions specialists at different colleges and universities to learn more their about specific requirements and offerings. Boston University provides approximately 33,000 students with an academic curriculum that integrates the liberal arts and sciences. The school's virtual arm includes a 36-credit master of education in educational leadership and policy studies: higher education administration. The program’s nine courses delve into the issues that impact higher education, harnessing students' leadership skills in preparation for administrative roles in student life, admissions, career advising, and alumni relations. Students take the part-time program fully online and complete the degree in two years. The curriculum includes study of strategic planning and administration, legal issues in higher education, governance and decision making, and diversity and justice. One notable course explores the impact of public policy, social change, and technology on higher education and how faculty and administrators can foster innovation and reform. Admission to the master's in higher education online requires a bachelor's degree, school transcripts, and a resume. Standardized tests are not required. Georgetown University emphasizes global citizenship and service through its program offerings. Learners seeking career advancement in higher education can receive training from the school’s hybrid 33-credit master of professional studies in higher education administration. Participants of the program gain competencies in change management, organizational culture, and leadership and ethics by immersing themselves in the study of operations, admissions, academic advising, and alumni relations. Coursework in the online master's degree in higher education administration begins with four foundational courses: American higher education, global higher education, student affairs, and organization and administration in higher education. The remaining seven courses include a course on ethics, electives courses, and a capstone. Students may enroll in the program part time or full time and complete the degree in two to five years. Admission requires a bachelor's degree, a resume, and school transcripts. UCF online administers one of the nation's most respected educational leadership programs: the 39-credit master of arts in educational leadership with a higher education/student personnel track that requires on-campus courses. The program incorporates both theoretical and practical learning opportunities that prepare students for administrative and leadership positions in education. The master's degree in higher education and student affairs online includes a six-credit core focused on graduate research in education and measurement and evaluation in education. The 24-credit specialization track includes studies in organization and administration of higher education, finance in higher education, student personnel services, and theories of college student development. A six-credit internship and practicum gives students experience in educational settings. Admission requires a bachelor's degree, school transcripts, and competitive GRE scores. Located in East Lansing, Michigan State University is one of the United States’ premier public institutions of higher education and research. Among its comprehensive list of degree program offerings is a master of arts in higher, adult, and lifelong Education (HALE) designed for individuals with prior professional experience in the field and who want to work full time while pursuing their degree. This online master’s degree in higher education program consists of 30 credit hours in courses like adult learning, program planning, and budgeting and finance. Students enjoy the freedom to take 15 credits in elective classes; nine of which must be in the HALE program, but the other six can be taken in approved collateral topics like business administration or learners with special needs. Independent research is part of the academic culture at MCU and HALE students enjoy faculty support for their pursuits. Tuition is based on residency status, but all students have access to a number of scholarships, ranging from small tuition awards to large packages. The University of Rochester administers several online programs, including a 36-credit master of science in educational administration with a specialization in higher education. 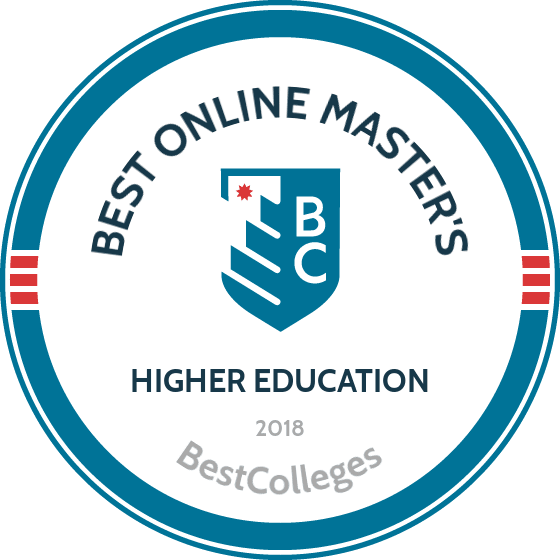 The master's in higher education online focuses on leadership and management, training effective decision-makers capable of motivating people and managing staff members. Students take coursework fully online or in hybrid format and focus on studies in student development theory, higher education law, college access and equity, and fiscal issues in higher education. Courses in student affairs administration cover topics such as admissions and residential life, and students gain hands-on experience through an internship at a higher education institution in the community. Full-time students complete the program in three semesters while part-timers do so in two years. Admission requires a bachelor's degree, school transcripts, and a resume. The State University of New York at Stony Brook is ranked among the top 100 universities in the nation and offers over 140 graduate degree programs. Among the selection is an online master’s degree in higher education administration suitable for those working in all manner of higher education environments, from community colleges and trade schools to four-year universities and government agencies. Students may complete their courses entirely online or through a combination of distance and on-campus education. The curriculum totals 36 credit hours where students hone their expertise in fundamental areas like leadership and diversity in higher education. They also choose six courses from electives that fit their career goals, ranging from facilities management and crisis management to international higher education and philanthropy. Students are required to complete a comprehensive research project that culminates in a final research paper. SBU provides its students with a number of co-educational and professional opportunities, including a number of career development workshops and access to the Higher Education Administration Association, which connects students with peers and experts in the field. Situated in North Carolina’s Blue Ridge Mountains, Appalachian State University offers a 36-credit master of arts (MA) in higher education that gives students the educational foundation and expertise necessary to function as effective postsecondary education administrators. Faculty deliver the program part time, synchronously and asynchronously, to allow students to continue full-time employment. Students may opt to take the community college and university leadership track; courses include organization and governance, college access and student success, and the higher education curriculum. One of the best higher education master's programs in the country, the MA also offers an adult and developmental education track that preps students to design, administer, and evaluate adult programs. Coursework includes study of adult and developmental education, college access and student success, and program development. Admission requires a bachelor's degree and the GRE or MAT. Texas Tech University houses several master's programs that prepare leaders to improve higher education. The College of Education's 36-credit master of education in higher education enrolls professionals experienced working at two- or four-year institutions or an educational agency. The two-year online program utilizes a cohort model with some classes delivered synchronously. Courses immerse students in study of access and equity, legal aspects and crisis management, the comprehensive community college, college student development, and administration in higher education. Learners will need access to a higher education institution in order to complete some courses and satisfy the required 150 hours of supervised higher education administrative work. A capstone and evaluation complete the master's in higher education online, with students synthesizing and applying the knowledge they acquired over the course of the program. Admission requires a bachelor's degree, school transcripts, and three recommendations. Founded in 1898, Northeastern University offers a master of education in higher education administration to address the evolving needs of education institutions. The curriculum immerses students in study of the structure, operations, and governance of colleges. Learners examine the landscape and demographics of higher education, and consider education as an advanced field of study -- learning how to connect theory with practice. A practicum course takes students overseas to conduct in-depth research in a specific location where they meet local school, business, and community officials to develop an understanding of higher ed within a global context. The design and development of an eportfolio gives learners an opportunity to showcase their competencies, as does participation in group projects. Students may enroll in the master's in higher education online full time or part time, completing the degree in one or two years. Admission requires a bachelor's degree and school transcripts. Mississippi College, located in the city of Clinton, was founded in 1826 as an academy teaching composition and rhetoric to a handful of students. Today MC is a comprehensive institution of higher education, offering a number of graduate programs, including an online master's degree in higher education administration. In order to prepare students of all backgrounds for several careers in the field, coursework is designed to ground students in general administrative theory and practice. The curriculum consists of 30 credit hours in topics like higher education law, organizational behavior, and the specific needs of community college students. Students are also required to complete two six-week practica, which involve at least 60 hours of work, a presentation, and a reflective paper. The program is usually completed in 18 months or less if a student is able to transfer the allowable six credits towards their degree. The school makes a number of scholarship available, including an award specifically for transfer students. Dallas Baptist University (DBU) uses a faith-based academic curriculum to cultivate servant leaders. The 36-credit master of education (M.Ed.) in higher education trains professionals able to lead higher education programs and support institutional missions. The degree offers two tracks: administration and instructional. Both tracks share a core curriculum focused on college and university administration, research methods in higher education, and biblical servant leadership. The 24-credit administration track focuses on community college leadership, distance learning, interdisciplinary studies, leadership studies, and student affairs leadership. Students choosing the instructional track work with advisors to develop a personalized 18-credit plan of study. DBU offers a dual degree program that allows students to complete the master's in higher education online and another master's with only an additional year of study. Students can take the M.Ed fully online or in hybrid format. Admission requires a bachelor's degree, a minimum 3.2 GPA, and competitive GRE scores. DePaul University uses a rigorous curriculum to train educators and administrators. Students hoping to become effective higher education leaders enter either the master of art (MA) in educational leadership or the master of education (M.Ed.) in educational leadership -- both include a concentration in higher education. The MA and M.Ed. cultivate professionals versed in both policy and how to collaborate and build consensus and coordinate institutional services. Both the MA and M.Ed. curricula examine topics like school law, effective leadership of schools, stakeholder relationships, and school finance. In addition to a supervised internship, the MA requires a thesis; students in the M.Ed., however, develop a capstone. Students enroll full time or part time and complete either degree in two years or three. One of the best higher education master's programs, students can take the educational leadership curriculum entirely online. Admission requires a bachelor's degree and school transcripts. Designed on a theory-to-practitioner model, the master of science in education program in the Department of Student Affairs Administration at UW-La Crosse prepares students to work effectively and collaboratively within the complex social, economic, and political world of higher education. Aside from a face-to-face on-campus program, the department boasts innovative asynchronous and blended approaches to online education. About two-thirds of SAA students are online students who either work as full-time higher education professionals or in graduate assistantship-type positions. Students take 40 credit hours over two years in higher education and student affairs competency areas, including diversity, inclusion, and equity, leadership, administration, assessment, history, helping and supporting skills, legal issues, finance and governance, and special topics seminars that change year-to-year to meet the changing needs of college students and institutions of higher education. Students also complete a capstone project, the results of which are shared with the university and greater community in an annual department-wide research day. Internships, while not a requirement, are strongly encouraged and students may complete an approved professional experience anywhere, whether in the U.S. or abroad over a summer semester. The SAA Department also attempts to provide students international opportunities, such as study tours to Great Britain or Germany, as well as domestic excursions. The SAA Program is home to outstanding tenure-track and clinical faculty, who together have extensive experience as student affairs professionals, and who exhibit excellence in research, scholarship, and service to the profession. Given the focus on excellence in teaching at UW-La Crosse, all faculty are primarily teachers who are deeply committed to guiding and preparing the next generation of student affairs practitioners. Students at Mercer University receive an education that integrates the liberal arts and professional knowledge. In just one year, the 30-credit master of education in higher education leadership preps learners for postsecondary administrative careers. As a hybrid program, students take some classes online and some on Mercer's Atlanta or Macon campus. Core professional classes include educational research, cultural perspectives, legal issues in higher education, and leadership in intercollegiate athletics. The nine-credit leadership track examines student affairs, leadership theory, and finance for higher education. Students must participate in a leadership academy during which they explore empirical research on topics in higher education, learn about the role of education leaders, and network with experts in education. Admission to the master's degree in higher education and student affairs online requires a bachelor's degree, official school transcripts, and GRE scores. Louisiana State University offers a 36-credit master of arts in education with a specialization in higher education administration that students typically complete in 15 months. Those pursuing careers in higher education administration and student affairs gain the knowledge and managerial skills necessary to assume positions in admissions, counselling, student activities, and academic support services. Twelve courses lasting seven weeks each focus on topics like community colleges, American college students, how to apply research in education, finance in higher education, and higher education and the law. A course in the master's in higher education online explores student development, examining theories and research on their intellectual, psychosocial, and career development. Completion of the program requires a comprehensive exam. Admission requires a bachelor's degree with a minimum 3.0 GPA and GRE scores. The University of Houston was founded in 1927 and today enrolls more than 43,500 students annually. Among the school’s 120 graduate programs is an online master’s degree in higher education designed for professionals looking for career advancement while working full-time. Delivered through the Blackboard platform, the 36 credit curriculum covers fundamental topics including student support services, leadership for change, and educational policy. While the UH program does not require a capstone project, students do take a comprehensive exam during their last semester. They are also expected to complete a semester-long internship of their choice (with guidance from faculty advisors). Students may also choose to take advantage of the professional development opportunities the program offers, including research and conference presentation opportunities. Tuition is priced per credit and based on residency status, and financial aid is available, including a $20,000 scholarship for students who can be considered “new Americans”. Located in Philadelphia, Pennsylvania, Drexel University was founded in 1891 with the mission of providing a technology-focused education designed to help students succeed in a complex industrial society. Today Drexel is a comprehensive research university, offering a number of degrees, including a master’s degree in higher education online. The school's 45-credit curriculum provides students with a historical framework of the workings of higher education in the United States as well as the connections between the university and the surrounding community. In addition to taking core courses in topics such as effective assessment and organizational leadership, students may also use their elective hours to forge a secondary concentration that further personalizes their degree in areas like “Global & International Education”, “Enrollment Management”, and “Student Development & Affairs”. Students must also complete a capstone project that challenges them to identify and solve an issue in higher education in a professional setting. At Drexel, structures are tailored to maximize student success, including internships through one of the university’s partners and mutual peer support through the school's Dragon Mentoring Program. Founded in 1798 as a seminary, the University of Louisville now offers academic programs in over 170 fields of study through its 12 schools and colleges, including an online master’s degree in higher education administration. Ideal for professionals who work fulltime in a college environment, the program is grounded in contemporary challenges facing higher education in the United States. The curriculum totals 36 credit hours and includes course topics in educational resource management, educational leadership, and history of American colleges and universities. Students must also complete a semester-long internship, which is graded on a pass/fail basis and is meant to provide on-the-job training and professional development opportunities. The degree can be completed in two years or less for students who are able to transfer up to six approved credits towards their degree completion. Active military and veterans, in addition to receiving a steep discount on tuition, may also use field training and work experience as transfer credits. Georgia Southern University's programs serve approximately 27,000 students, many of whom earn the school’s 36-credit master of education in higher education administration. The program equips learners for leadership roles in academic affairs, student services, alumni relations, and similar postsecondary areas. A flexible program with part-time and full-time enrollment options, the degree includes a core that covers learning theories and applications, educational research, and technology for higher education leaders. The major engages students in an in-depth analysis of the contemporary college student, American higher education, higher education administration, and a practicum. The program specializes in finance, governance, student affairs, community colleges, and ethical and professional issues in student services. Students take coursework delivered asynchronously and can enroll in the master's degree in higher education online in any semester. Admission requires a bachelor's degree with a minimum 2.75 GPA and GRE or MAT scores. Established in 1973, the University of Houston-Victoria offers a 36-39 credit master of education in adult and higher education with two tracks: adult education and higher education. A changing higher educational landscape requires educated administrators equipped to effectively lead postsecondary institutions. Both tracks share a 21-credit core that examines subject like educational leadership in organizations, adult education foundations, IT trends and issues, and program planning and development. The adult education track explores the characteristics of the adult learner, adult development, self-directed learning, and continuing professional education. The higher education track examines higher education history, college teaching, college students, and the American community college. Students also participate in an internship and a three-credit research course, taking a comprehensive exam to exit the higher education master's program. Admission requires a bachelor's degree with a minimum 2.5 GPA. The University of Nebraska-Lincoln offers a 30-43 credit master of arts in educational administration with a higher education administration focus. The curriculum prepares administrators in the areas of student affairs, advising, enrollment management, and student engagement. The curriculum covers topics like administrative theory, higher education in the U.S., personnel development, college student development, and finance in higher education. Part-time students complete the program in two years and can maintain their careers and private lives while working through the program. With 15 additional credits, learners may earn a certificate in community college leadership that qualifies them for leadership roles at two-year institutions. Students must take a comprehensive exam to exit the master's in higher education online. Admission requires a bachelor's degree and school transcripts. Endicott College employs an experiential learning model that emphasizes learning by doing. The school’s 36-credit master of education in higher education leadership immerses students in the contemporary issues facing postsecondary education. Learners prepare for roles as advisors and administrators in higher education by examining theories in higher education leadership, professional communications, the evolving roles of the professoriate, and legal and ethical issues. A course on action research in higher education shows learners how to conceptualize, design, implement, and evaluate a research project. Students also learn to evaluate an institution's performance during a notable budget, finance, and operations course, focusing on how to develop short-term and long-term budgetary and financial plans. A thesis culminates the online master's degree in higher education administration with a required research project on higher education leadership. Admission requires a bachelor's degree and school transcripts. West Virginia University Online offers more than 30 degrees and hundreds of courses to undergraduate and graduate students. The school administers a 30-credit, two year master of arts in higher education administration that enables students to develop a personalized plan of study in preparation for administrative and executive higher education positions. Coursework includes studies in college student development, program evaluation, higher education administration, and contemporary issues in postsecondary education. Students delve deeper with 15 credits of specialized electives such as student affairs, planning and budgeting, community college leadership, and curriculum development in higher education. A capstone requires an internship placement, participation in discussion groups, and the development of a weekly journal and portfolio. Admission to the master's degree in higher education and student affairs online requires a bachelor's degree, a minimum 3.0 GPA, and competitive GRE scores. Located in Hempstead, New York, Hofstra University was founded in 1935 and today offers 25 academic programs, including a Master of Science in Education in Higher Education Leadership and Policy Studies. Ranked as one of the best graduate education programs in the United States, this degree prepares students to enter or transition into middle and senior leadership positions in higher education institutions, whether that be a private university or a government organization. The curriculum totals 36 credit hours and includes courses in assessment and accreditation in higher education as well as ethical issues and student affairs leadership. Students in this online master’s degree in higher education also take two elective courses, chosen under the advisement of the program director, and complete a completion/capstone project where knowledge and experience gained are used to identify and solve a pertinent issue in the higher education field. The program offers a number of scholarship and paid internship opportunities to help students fund their education. Pennsylvania State University enables nontraditional learners to earn a degree from anywhere in the world. Those interested in higher education enroll in the 30-credit master of education in higher education. The program accommodates working professionals with a flexible online curriculum that examines administration, student engagement, institutional research, and fundraising leadership in higher education. Course topics include administrative leadership, planning and resource management, college teaching and academic advising, designing institutional research studies, and achieving success through fundraising leadership. An optional internship at a higher education institution places students in administrative offices, in college teaching positions, and on instructional teams in order to hone competencies. Students develop a capstone under faculty supervision. Admission requires a bachelor's degree, school transcripts, and the GRE or other standardized test such as GMAT or MAT. The University of New Orleans offers a hybrid 36-credit master of education in higher education that gives students the opportunity to attend classes on campus and online. The program's notables include comprehensive study of various postsecondary functions like student affairs, academic affairs, and assessment. The curriculum emphasis leadership at urban and metropolitan colleges and gives students the opportunity to participate in research with faculty and doctoral students. Courses in the online master's degree in higher education administration include study of student services; college student development; teaching, learning and curriculum; and diversity in higher education. Students may use electives to pursue areas of interest, and a three-credit internship puts learners in a college or related educational setting to apply theories learned in real contexts. Admission requires a bachelor's degree and school transcripts. Students at Marywood University receive an education steeped in the school's Catholic intellectual tradition. The school offers a fully online, 36-credit master of science in higher education administration that prepares learners for careers in student affairs, academic advising, and institutional advancement. A professional core examines human development, learning theories, foundations of education, and research theory. The 24-credit higher education administration concentration explores issues like program development, college finance strategy planning, law and public policy, and multicultural counselling. Students may use electives to specialize in a functional area within the master's in higher education online. A 150- to 300-hour internship component allows students to apply the principles learned in a higher education environment. Admission requires a bachelor's degree with a minimum "B" average and school transcripts. Bay Path University, located in Longmeadow, Massachusetts, was founded in 1897 as a co-educational business. Today the school is a fully-accredited institution of higher education dedicated to providing affordable and career-oriented academic programs, including an online master’s degree in higher education administration. Designed for seasoned professionals as well as those interested in entering the field, this master of science program consists of 36 credit hours, 24 of which is taken in fundamental topics like introduction to higher education administration, the history and economics of higher education, and the capstone project. The remaining credit hours are completed in courses tied to a student’s concentration area, of which there are four: enrollment management, institutional advancement, general administration, and online teaching & program administration. This last choice is a stand-out and prepares students to design specific curricula for distance learners as well as help build and maintain online learning communities. Valdosta State University offers programs that combine eLearning with on-campus learning. The hybrid 30-credit master of education in higher education leadership trains administrators in student learning and development theories, in the interpretation of financial information, and in the challenges facing postsecondary institutions. The curriculum focuses on school culture and change; ethical and legal issues in leadership; leadership for community and public relations; curriculum, instruction, and technology integration; and technology leadership for school improvement. The master's in higher education online requires completion of one or two internships, each lasting a semester. An advisor provides feedback and coaching that fosters the student's leadership development. Graduate assistantships on campus help defray tuition costs while providing students with practical experience in a higher education setting. Admission requires a bachelor's degree with a minimum 2.5 GPA and GRE or MAT scores. The College of Education at the University of Missouri-St Louis prepares a cadre of postsecondary support staff, including educational scholars and administrators. The school designed the 36-credit master of education with an emphasis in adult and higher education for educators hoping to improve their adult teaching skills and administrators seeking career advancement. The blended program examines higher education curriculum, how to improve instruction in adult education, adult learning and development, and organization and administration in higher education. Learners take 12 credits in electives and up to six credits in research coursework such as classroom measurement and evaluation. An internship serves as the exit requirement for the master's in higher education online. Admission requires a bachelor's degree with a minimum 2.75 GPA and GRE or GMAT scores. Part of the university system of Georgia, Columbus State University touts nationally distinctive programs in disciplines like education. The school offers a 36-credit master of education educational leadership with a higher education track that faculty deliver fully online. The program’s nine-credit core explores applied educational research and school culture and diversity. An internship experience requires students to work in multiple settings with parents, staff, and community leaders. The concentration immerses students in study of student affairs, student development theory, the American college student, and assessment and program evaluation. A course in adult learner instructional strategies focuses on how the education profesional can facilitate and implement research-based instructional strategies. Admission to the master's in higher education online requires a bachelor's degree with a minimum 2.7 GPA and the GRE. Affectionately known as Ole Miss, the University of Mississippi was founded in 1840 and stands today as one of the most prestigious public institutions of higher education in the United States. Ole Miss is a comprehensive institution, offering a wide variety of academic programs, including a master’s degree in higher education online. Designed for individuals already working in a college or university, this professional MA prepares students for advancement in the realms of student affairs, academic advising, administration, and more. The 42-hour curriculum can be completed in two years part-time with coursework over the summer. Students take most of their courses in fundamental areas like cultural context of education, law and ethical issues, and finance in higher education. They also choose four electives from a large catalog, enabling them to personalize their degree to current experiences and future goals, whether that be in multicultural issues or the specific needs of the community college. A practicum of 150 supervised clock hours is also a requirement for graduation. Online tuition for this program is priced at a flat rate no matter a student’s residency status. Located in Lebanon, Illinois, McKendree University is the oldest college in the state having been founded by 1828 by members of the Methodist Church. Today McKendree offers a number of graduate degrees through its established distance education program, including an online master’s degree in higher education administration. Grounded in the business theory and associated analytical tools of the “best practice” framework, students learn how to maximize the effectiveness of key functions in a higher education organization, from recruiting to assessment. Totaling 36 credit hours, students take courses in such topics as integrated data services, branding and enrollment management, and issues in student access. Students must also complete a capstone in “Best Practice Intervention”, where they work in teams to complete research projects that they present in synchronous online sessions. Courses are offered in eight-week sessions and students can complete their degree in two years or, if they choose the accelerated track, 14 months. Grand Valley State University enrolls more than 25,000 students and offers 128 degrees. The Michigan college administers a robust program for those seeking to work with adult learners. The hybrid 36-42 credit master of education in higher education offers emphases in adult and higher education and college student affairs leadership. The adult and higher education emphasis includes study of adult learners, the American college student, the community college, and higher education and student affairs functions. The college student affairs leadership emphasis covers college student development, administration of student affairs, student affairs administrators and the law, and intervention strategies for student development. Both specializations require a capstone or thesis to graduate one of the best higher education master's programs in the country. Applicants need a bachelor's degree and a minimum 3.0 GPA. Shaped by the institution's Jesuit tradition, Loyola University Chicago provides its 16,000 students an education that emphasizes learning, justice, and faith. Loyola's 36-credit master of education in international higher education trains administrators to thrive in a global educational landscape, well-versed in areas such as administration, higher education policy, and international student affairs. Unique among higher education master's programs, Loyola teaches the curriculum online but requires students to travel for a one-week visit to Loyola's Beijing Center and a two-week cultural immersion in Rome. Online courses include studies in education leadership, American higher education, educational policy analysis, and multiculturalism for social justice. An internship in the student's community and a portfolio serve as culminating experiences. Faculty use a cohort model to deliver the program, and students typically complete the program in two years. Admission requires a bachelor's degree with a minimum 3.0 GPA. Messiah College integrates traditional liberal arts with applied learning in the arts and sciences. Virtual learning options include the 36-credit master of arts in higher education, which develops learners' knowledge and leadership skills from a Christian perspective. Students explore the nuances of admissions, student activities, academic advising, and resident life. The hybrid curriculum examines subjects such as curriculum development, academic engagement, organizational culture and governance, institutional assessment and effectiveness, and strategic leadership in higher education. The master's degree in higher education and student affairs online provides students with the option to choose from nine-credit concentrations in academic support, student affairs, strategic leadership, collegiate athletic leadership, or an individualized option. Students engage in 120 hours of supervised work at a college or similar organization for an internship requirement. Students may complete the program in two years. Admission requires a bachelor's degree with a minimum 3.0 GPA. National University is located in La Jolla, California, and offers academic programs through its 28 campuses and distance education platform, including an online master’s degree in higher education administration. Facilitated through the Sanford College of Education, this master of science program prepares students to perform key functions in a college or university setting, from managing recruiting efforts and implementing university-wide initiatives, to assessing effectiveness and cultivating positive relationships with the local community. The curriculum consists of 10 courses in topics like financial management and policy and accountability. Students are also expected to conduct research that culminates in a written thesis judged by a faculty committee. Students at NU also have a number of professional and academic services, from career advice and assistance to the opportunity to attend and present at a number of gatherings, including the annual Women in Leadership Conference and The Student Research Conference. Tuition is calculated per quarter unit instead of the conventional credit hour. The largest college in the Kansas city area, the University of Missouri-Kansas City focuses on research and service in the community. Learners in the master of arts in higher education administration acquire competencies required for research design, social change in higher education, and effective communication. The program’s professional core examines topics like the history of higher education, organization and administration, philosophical foundations of education, and the principles and methods of research. Students choose a concentration in disability services, student affairs administration, foundations of higher education, or sports administration and exercise science. Learners may also develop an individualized concentration by choosing courses from a wide selection of electives. Whichever concentration they choose, learners participate in hands-on learning experiences through an internship. Students can complete the hybrid master's in higher education online in 2.5 years. Admission requires a bachelor's degree and a minimum 3.0 GPA. Saint Peter's University emphasizes learning that integrates rigorous academics, internships, and community service. The school’s 33-credit master of higher education in general administration preps administrators for roles in higher education departments such as admissions and student affairs. The curriculum focuses on theoretic principles, administrative practice, data-based decision making, and policy and strategic prioritization. The fully online curriculum includes topics such as innovative curriculum strategies, organizational behavior and administration, finance and budget planning, accountability: assessment and accreditation, and directed research in education. A course in online college teaching and learning examines Quality Matters, standards established to encourage best practices in online education. During a global comparison of higher education course, students compare national and international colleges to identify best practices and weaknesses. A comprehensive exam serves as the exit requirement for the program. Admission to the online master's degree in higher education administration requires a bachelor's degree and official school transcripts. Sam Houston State University was founded in 1879 and is one of the oldest public institutions of higher education in Texas. Located in Huntsville, SHSU offers a number of academic programs, including an online master’s degree in higher education administration designed to prepare students for career advancement in the field or for continued education at the doctoral level. Students take courses in topics like diverse student populations, assessment and research methods, and resource management. Though the program has no capstone or internship requirements, students do take a practicum in instructional leadership that bridges the gap between theory and practice, and enhances their professional knowledge as they work in real-time with the guidance of a site supervisor. The general curriculum totals 30 credit hours, but students may opt to take the advanced 36-hour track which earns them an academic advising certificate or an assessment and institutional research certificate in addition to their master of arts. Tuition is priced specifically for online graduate students so residency requirements do not apply and tuition is the same for everyone enrolled in the program. Financial aid is available. The University of Wyoming’s School of Counseling, Leadership, Advocacy, and Design offers a 33-credit master of arts in higher education administration that enables students learn how to design, deliver, and supervise high-quality adult education programs. Through the fully online or hybrid curriculum, learners examine learning theories, trends in adult education, how to teach adults, the adult education movement, and international comparative education. Participants learn more about community colleges during a course that explores a school’s core philosophy, organization, and administration. During a capstone course students incorporate and apply the theories and principles learned during their studies. The school requires a capstone defense on the Laramie campus in the spring semester. Graduates work in adult and postsecondary education or related for-profit or nonprofit organizations. Admission requires a bachelor's degree with a minimum 3.0 GPA. North Park University is Chicago's city-centered Christian University. The School of Business and Nonprofit Management (SBNM) provides specialized, interdisciplinary, and flexible learning opportunities alongside a curriculum designed to offer practical application and multi-faceted teaching methods--all in a personalized, inclusive, and values-centered environment. SBNM offers five master’s degrees--MBA (master of business administration), MNA (master of nonprofit administration), MOL (master of organizational leadership), MHEA (master of higher education administration), and MHRM (master of human resource management)--each combining industry-driven courses, practical experience, and ethics. North Park's competitive tuition rates, online opportunities, scholarships, and certificates offer an affordable path to career advancement. The school's online master’s degree in higher education administration (MHEA) curriculum focuses its 13 core courses and five electives on principles of management and higher education within a nonprofit framework. MHEA candidates develop the skills needed to manage teams, understand the higher-ed learner profile, and assist organizations in the ethical decision making process. Located three hours west of Dallas, Texas, Abilene Christian University opened its doors in 1906 with only 25 students. Today ACU is an innovative institution of learning, offering a number of distance education programs, including an online master’s degree in higher education. Designed as a specialized 18-month program, students choose between tracks in conflict resolution and enrollment management in addition to their core classes in fundamental topics like resource management, student development theory, and legal and ethical issues. Depending which aforementioned track a student picks, they will take additional coursework in negotiation and mediation or marketing and recruiting, among others. Students must also complete an internship with embedded capstone experience, which provides ongoing skill application and culminates in an exhibition. Financial aid is available to all students. The University of Wisconsin-Milwaukee’s academic programs develop well-rounded professionals proficient in their fields. The 33-credit master of science in administrative leadership offers a concentration in adult, continuing, and higher education administration. The program incorporates theory to practice methodology, collaborative learning, and community partnership research. Students elect to take either the fully online or hybrid sequence of study. The curriculum covers topics such as the foundations of adult education, the administration of adult education programs, using technology with adult learners, college student personnel administration, and strategic planning and budgeting. Students may choose up to 18 credits from a comprehensive catalog of electives. Students must develop an eportfolio in the last semester of the two-year program. Participants in the master's degree in higher education online learn in small classes. Admission requires a bachelor's degree and school transcripts. Geneva College's academic curriculum upholds the school's Reformed Christian tradition. The 36-credit hybrid master of arts in higher education cultivates principled leaders through a curriculum saturated with the knowledge necessary for career success and for the development of a Christian perspective of higher education. A 10-course core examines topics like the foundations of higher education, college students in America, college student success, and the foundations of educational research. Students take one of two formats. The first is an accelerated program that students complete in 21 months that allows them to participate in graduate assistantship opportunities at the college or a neighboring school. The second is the Institutes Program, which allows students to stay in their positions as they complete the program in two years by attending summer and winter institutes. Admission to the master's degree in higher education and student affairs online requires a bachelor's degree and a minimum 2.8 GPA. The curriculum for a master's in higher education degree online program will cover a wide range of pertinent topics. Students should expect coursework in areas like educational laws and ethics, finance in higher education, educational technology, research in education, student affairs, and classroom management. Some programs allow students to earn a 'specialization' for their master's in higher education degree in fields such as community college or higher education administration. In most cases, however, 'higher education' will serve as the specialization for a master's in education degree pathway. Practicum experiences are common in master's of higher education degree programs online. These on-site opportunities expose students to the realities of working at colleges and universities, and allow them to receive hands-on training from professors and faculty members, administrators and other postsecondary personnel. Many programs also require capstone projects, which allow students to use the knowledge and skills they have gained to address contemporary trends and issues in college learning. It's important to research the accreditation status of a master's in higher education degree program before fully committing to it. In the U.S., online higher education master's programs receive accreditation from the Council for the Accreditation of Educator Preparation (CAEP). In addition to programmatic accreditation, make sure that the college or university has received regional or national accreditation. According to the Bureau of Labor Statistics (BLS), the job outlook is very favorable for postsecondary educators and administrators. Jobs for professors and other teachers are expected to rise by 13% ― or roughly 177,000 positions ― between 2014 and 2024. Likewise, jobs for college administrators are projected to increase by 9%, or 15,200 positions. Both of these growth rates are higher than the national projected average for all occupations, which currently sits at 7%. How do postsecondary teachers and administrators stack up against other educators in terms of projected job growth? The table below features looks at the number of jobs and expected growth for six different education-related occupations. As the table indicates, projected job growth is stronger for postsecondary teachers and administrators than any of the other occupations listed. In addition to outlook and job growth, those with a master's degree in higher education also enjoy higher earning potential than their counterparts in elementary or secondary education. The salary expectations for postsecondary employees is largely tied to their area(s) of master's degree study. Using data from the 2016-17 PayScale College Salary Report, the following table features earning estimates for four different education majors at two early-career benchmarks. The average wage premium (or salary growth) among the four fields listed was a 41.95% increase in earnings between the entry-level and mid-career stages. In addition to degree specializations and areas of study, the salary potential of a higher education professional will also vary by specific job title. Other important factors include experience level, employer size and city/state of employment. The next table looks at salary projections for four common career paths for higher education master's recipients. All four occupations experience a salary growth rate of at least 37% after 20 years on the job. College administrators reported the highest growth rate: an 80.5% increase in earnings between the entry-level and late-career stages. Professors ranked second with 64.1% salary growth, followed by admissions counselors with 42% growth. Students who graduate with a master's in higher education will be well-positioned to enter the workforce and seek jobs in administration, or advance to a doctoral degree program and train to become a college professor. According to the BLS, most postsecondary teachers require a doctoral degree. However, community college professors and professors at certain four-year colleges and universities may be able to land a job with a master's in higher education. Roughly 76% of postsecondary teachers work for "colleges, universities, and professional schools", while another 20% are employed at junior colleges. Regardless of what kind of courses they teach, postsecondary teachers earn a median annual salary of $72,470. However, salaries for professors will depend on their subject area. Check out the table below for a detailed breakdown. As the table shows, the difference between the highest salary among postsecondary teachers ($125,430 for health specialties) and the lowest salary ($70,260 for education) is more than $55,000 per year. Postsecondary Education Administrators: In addition to professors, many students who graduate with a master's in higher education will go on to pursue administrative careers. These personnel include deans, academic advisers, housing officials, registrars and financial officers. Making professional connections and learning about different approaches to higher education is crucial to your success. Professional organizations offer a great entry point for students who want to learn more about their chosen career path. Below you'll find three of the country's most prominent organizations established for higher education teachers and administrators. These organizations host networking events, provide online trainings, maintain active job boards, and offer other services for career-ready college graduates. Resources like these often prove invaluable as you complete your degree requirements and prepare to enter the job market. American Association of University Professors: Founded in 1915, the AAUP is a nonprofit organization based in Washington, DC. The organization's branches include the AAUP-CBC, a labor union that advocates for postsecondary personnel; and the AAUP Foundation, a public charity that provides grant-funded support to colleges and universities across the country. Student Affairs Professionals in Higher Education: This organization (abbreviated NAPSA) currently represents more than 15,000 members at 2,100 postsecondary institutions worldwide. NAPSA has spearheaded a wide range of initiatives targeting predominant issues in higher education, including equity and diversity, violence prevention, technology and mental health. The National Educational Association: Working to improve public education from preschool to graduate-level studies, the NEA provides resources on current regulations, strategies for securing financial support and tools for creating high-quality lesson plans. Membership opportunities are available for working employees, retired professionals and students. Despite the relative affordability of online master's degree programs, most students still need financial assistance. Students should complete a Free Application for Federal Student Aid (FAFSA) form to learn more about loans, grants, and other opportunities offered through the U.S. government. Additionally, private grants and scholarships are widely available through nonprofit organizations, companies, and other sources. Check out our collection of resources below to learn more about financial aid options.